The poll also shows that seven in ten (69%) believe that protecting human rights in Tibet is more important than or as important as maintaining good trade relations with China. Only 14% considered human rights in Tibet to be less important than trade relations. “Just last week in a meeting at the Foreign Office, Free Tibet was told that commercial interests do not drive UK policy on China. Our poll confirms just how few people outside Whitehall find that claim credible. The UK has sunk so low in its desperation to curry favour with Beijing that David Cameron isn’t so much rolling out the red carpet as lying under it. Tibet campaigners will be staging demonstrations throughout Xi Jinping’s visit, including at Downing St on 21 October as Xi meets Mr Cameron. The will carry a large banner saying Cameron: has China bought your silence? Speak out on Tibet. A digital “advan” will also follow the president in London, carrying a Tibetan flag and a separate image of David Cameron gagged by a Chinese flag, saying Warning: Chinese president in town. 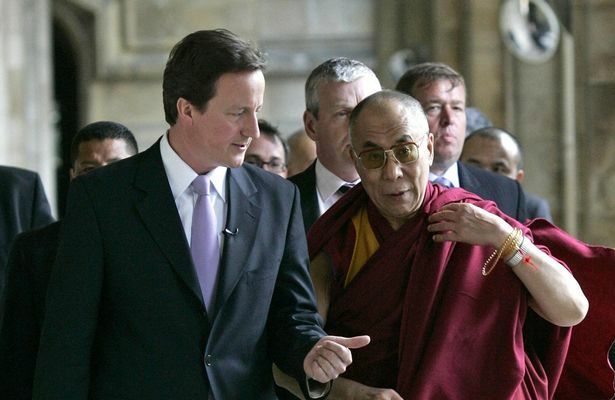 Don’t mention Tibet or human rights.